While the available Actions and Event types vary according to the type of custom rule you are creating, the following steps are generally applicable to any digital messages, e-commerce, purchases, retail events, web browsing or similar event-based rule. The type of rule, for example, Purchases, highlighted in a small box. Under Action, select the appropriate action for the rule, for example, Has not clicked, Has an abandoned cart, Has an order line, or similar. If you select certain actions for an e-commerce, retail events or web browsing rule, such as Has web events, you can then define the Event type that is used for the interaction in the appropriate condition fields. For example, if you are creating an E-commerce rule and choose Has no e-commerce interaction as the action, with Equal to and added to cart as the Event type, all contacts who have never added something to their cart are selected. If the Event type condition is not displayed, try using the Add condition panel, as described below, to add the field and its controls, if it is available for the selected Action. If Occurrences is displayed, use the appropriate operator and value to define how often the Action should have taken place. Under Time frame, select when the action should have taken place. The action can have taken place at any time. No further options are displayed. Click the Calendar icon in each box and define the date range. Only the first date field should be completed. Only the second date field should be completed. Both date fields should be completed. The action must have taken place in the defined time period. Enter a numeric value in the first box, for example, 3. Click the downwards pointing arrow to the right of the second box, and select days, weeks, months, or years. See Time frame conditions for more about time frames. Under Match, select whether the contacts that are to be identified by the rule, should match ALL of the conditions you define in the next steps, or ANY of them. 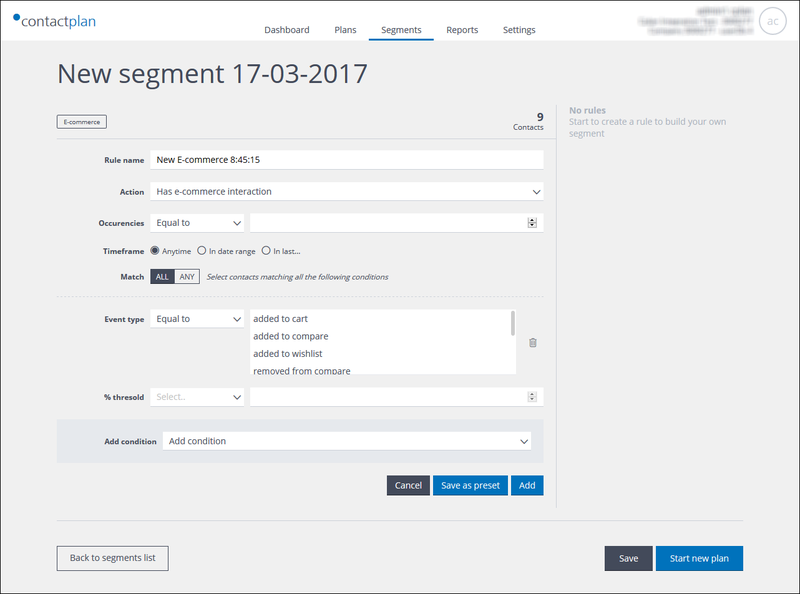 Use the Add condition panel to select the appropriate condition, for example, Event type, a product event property or similar, from the drop-down list. The new condition is added to the page. Select the appropriate operator, for example, Equal to, from the drop-down list in the first box. Enter or select the appropriate value in the second box. The % threshold condition is used to identify contacts whose activities satisfy a percentage range that is applied to a specific event type, while also meeting the other conditions defined for the rule. For example, contacts who have added an item to their shopping cart on more than 10% of the occasions that they have interacted with your e-commerce site. The % threshold condition can only be applied if at least one other condition is set in addition the Action and Time frame fields.